This is a little essay that takes a very serious,thoughtful topic and makes it silly and trivial. Some folks think I excel at this. I am not a very religious person, but when I was a little girl, I tried to be. I liked the idea of religion because I liked ceremonies. Sacred music and processions and candles were all right by me. Not to mention vestments. I loved the priest best in white and gold. The green poncho did not flatter him at all. As much as I liked rituals, however, I couldn’t grasp many religious concepts. Especially troubling to me was Omniscience. How could God know everything going on? Could he really watch all the fish in the Pacific Ocean, and then the other guys in the Atlantic Ocean? Could he know what each little fish was doing, and all the little birds too, and the ants in South America and the elephants in Africa, and still know whether I was doing my homework or not? The very idea of keeping track of millions of things at the same time, and paying attention to all of them was incomprehensible to me. But I think now I understand how it could be done. There are millions of people out there, maybe as many as the ants in South America, and they are all clicking on different sites all at the same time. Shopping sites, news, games, blogs, recipes, jokes, sports. Videos of symphonies and of cats playing ping-pong. And everything that everyone does is tracked. All at the same time. And what you have done in the past leads to what you will do in the future. And the Internet becomes omniscient. I watch videos of President Kennedy; I read reviews of Donna Karan cologne; I listen to James Taylor. I get an email offering me concert tickets and Sweet Baby James CDs. On Facebook, there’s a perfume ad with ‘free’ shipping. And Amazon not only offers me books on Kennedy, It knows that I am an assassination conspiracy nut, and offers me all kinds of interesting conspiracy nut books. Did you know that there is a secret underground city beneath the Denver airport? Which leads to another part of omniscience. It not only knows what I like, but what I might like. If I like Cashmere Mist, I might like Eau de Chloe. And I do! I do! Why, I am certain that if those fish in the Pacific had computers, they’d be seeing banners on the Fish page of the Huffington Post for L’Oreal Scale Conditioner. And the blue fishies are getting a special kind of blue scale conditioner while the red fishies are getting ‘Just For Redheads’. But there is another facet of Omniscience that confounded me as a kid. If God knows everything we do, and everything we are going to do, why does God let bad things happen? If God cares about everyone, why doesn’t He fix stuff? Anyway, How can God allow tragedy? And – not to be blasphemous (although I guess I already have been) – the Internet has cleared this up for me too. Of course, God and the Internet both know the future (despite the appearance of free will). God lets me choose, even though He secretly knows what I will choose. Cardigans, in this case, and not Italy. Knowing the future, it only goes to follow that God doesn’t always believe me. Like the promises I made while taking that geography test in fifth grade. Or that last really bumpy flight from D.C.
And I guess the Internet doesn’t always believe me either. Even though I have been bragging about my weight loss and how I am getting younger instead of older, it keeps presenting me with offers for plus-sized clothes. What does the Internet God know about my future that I do not? And worse! Last week this ad showed up – TWICE! Thanks. Unique is such a polite word. This was great!! We were just talking about this yesterday, but the Internet knows that already. And it knew you would write that … and that I would write this. Having read this post, I have to ask myself – WHY oh why does the Omniscient Internet keep offering me items designed to increase the size of an organ I have never possessed??? What does IT know that I don’t?! It may know that you have a tiny boyfriend in your future. We may have been separated at birth. I am continually frustrated by my friends who praise God for things as small as the traffic light turning green, yet when horrible things happen they say, “We brought it upon ourselves. God doesn’t cause bad things to happen.” Hmm, he gets all the credit and none of the blame? Sounds like a politician, or my boss . . . LOVED this essay by the way!! Made my day. It’s very spooky isn’t it. Or creepy, depending on your point of view. It always freaks me out that the internet always shows me Real Estate Agents in the town I lived in. When I moved, so did they! I get worried about job listings. Why does the internet think I should pursue other jobs? So God is the Internet. I knew it! 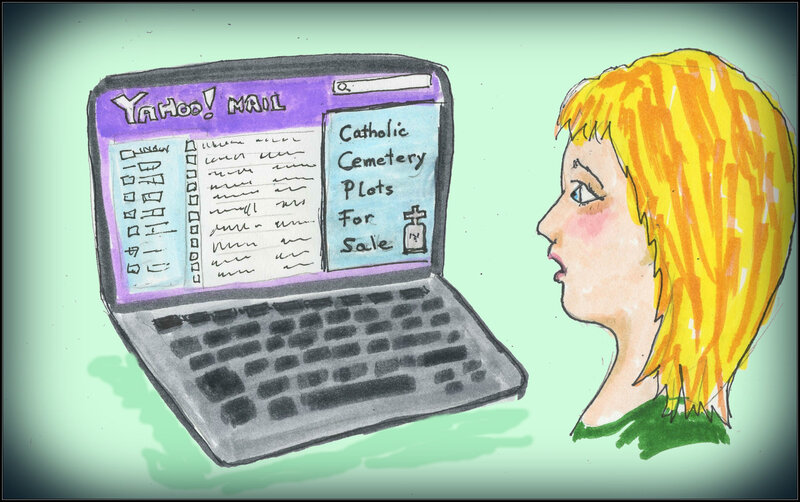 And I just got ANOTHER ad for Catholic Cemeteries – telling me I should “Arrange an Appointment Today”. Gee Whiz, God, I was just joking…. Well He’s certainly giving me a message with the cemetery plot ads. Ha! I’ve felt similarly puzzled when bombarded by weight loss ads, even though I have absolutely no desire (or intention) to lose weight. (And, even though I don’t wear a single-digit size, I stubbornly maintain that I don’t need to). My theory is that the Internet’s omniscience is seriously undercut by cultural bias: all women must either be thinner or want to be. And since I doubt that you were ever REALLY plus-sized (whatever that means), I’m going to take the plus-sized clothing ads as more proof of this bias. I’ve been researching troubled teenagers for a novel I’m writing… but I don’t want one. Nancy. This was a fun post. I do believe in God (wholeheartedly) and I think you’re not too far off base. None of us will know for sure on this side of the “veil,” but I think you’re on to something about human “free will” being the motivating factor for so much evil that goes on in our world. Actually, I am amazed that any good happens at all because our human tendency toward self-centeredness is extremely strong (i.e., a room full of two year olds with not enough toys = man at his worst and the unified war cry of “MINE!”). The question is “why would a god create a world and let free will have so much freedom?” I am afraid that will puzzle me until the day I die. Sigh! Maybe we only think we have free will. And that’s why I am so susceptible to advertising. You have finally discovered the Secret to Life. You mean it’s not a good haircut? God caused the internet to be invented so he could take a vacation. That’s a very viable theory. I’m sure God can track all us humans so much more efficiently. Keep the web address in your wallet. At least I just got a Medicare supplement ad, and not the another cemetery plot. Does this mean that God invented the internets and not Al Gore? God guided Gore’s hand through a radio ad. Liebster award, waiting, just waiting for you. Thanks. I’m very happy when someone likes my blog. Wow, I don’t think i’ve ever read such a convincing explanation! I very timely post, given that I’ve experienced a few personal losses in the past year.